Select Web Transactions from the Explorer panel. 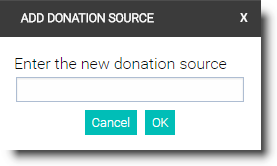 Select Donation Source Setup tab. Click Add to save a new Donation Source, click Edit to modify or Delete to remove a Donation Source.